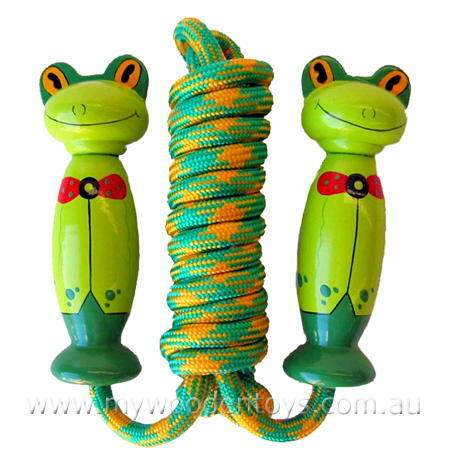 Wooden Frog Skipping Rope is a happy little toy with a lovely froggy shapes for handles. Skipping is a great skill to learn and your little one will spend ages trying to master it. Skipping is healthy, fun and really wonderful for learning co-ordination. A great traditional toy, Skipping Ropes have been around forever. Material: Wood, Child-safe paint, Rope. We like this because: "Healthy toy with frogs and a nice green and yellow rope... what more could you ask! " My xmas goodies arrived and am delighted to write that they were delivered promptly and the quality was great. I am looking forward to watching my granddaughter tear the paper to find such brightly coloured gifts ready for actionð. Birthday is coming up and I am already perusing the website for ideas.